SpectorSoft and eBlaster no longer exists. The company has since rebranded, and is now called Veriato. Although eBlaster use to cater to every day users, such as parents, and small business owners, it has decided to drop those services completely to focus on large corporation technology monitoring. They no longer wished to provide service and support to a large number of customers. Instead they now focus serving much larger companies. For parents, or medium sized companies, they no longer provide a compatible service at the offered price points. Please refer to other cell phone tracking vendors for such services, but if you are a large corporation, Veriato is an excellent choice. 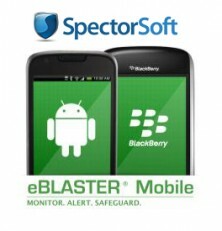 Since 1998, SpectorSoft has been creating programs to help protect and monitor businesses and home computers and have now grown into the Android mobile platform with eBlaster. The Florida based software developer counts hundreds of fortune 500 clients and offers very sophisticated business solutions that are tailored for specific needs from employee computers to server infrastructure. They offer varied plans for varied platforms and needs for both Business and Home, and it quickly becomes daunting and confusing to the average visitor looking around the website. They have both, Spector Pro for computers only and eBlaster for computers and Android devices, so instead of listing the features of all individual products or strictly covering the mobile Android app, we will explain what each service offers and does differently, to give you a clear understanding of their products. This product operates like all other remote spy apps and is offered both for computers and Android, but unfortunately does not support Apple iOS at this time. Depending on your device/operating system, different tracking features are offered and include the following for Android; call history, text messages, web history, GPS location tracking, and access to photos, all accessed remotely through their online portal. Geo-fencing alerts can be set to send an alert if the device exits a pre-set area, as well. On Windows, the software is feature rich and allows for more tracking and logging options along with social media and a key logger, while Mac OS has a similar amount of features with some exceptions. On the other end, you have a computer only tracking and monitoring product that does pretty much everything you can imagine, from email, Facebook, Keystroke logging, chats, website history, keyword alerts, and parental controls/website filters. Additionally, more advanced options are offered such as recording video of the actual computer screen display, capturing every action, and the capacity to remote view the recorded footage. So what’s the main difference between eBlaster and Spector Pro? Well, the ladder is designed for local use only, meaning you need to have access to the computer when you need to recover history logs, chat sessions, emails and so on. If you need to change any settings or block sites, you also need to have access. Meaning that Spector software is much better for a home computer, for example. The 360 solution is designed to monitor and protect large network infrastructures for businesses with top efficiency. Any business owner concerned about having any breaches of agreement, data leaks or simply improve production, the service is the most advanced and well-rounded system currently available on the market. The Spector 360 Recon was specifically designed with employee privacy in mind. Instead of focusing on monitoring and tracking employee activity, it finds a balance where the worker retains his privacy and the security of the network is kept strong and completely visible. Spector CNE is designed for small & medium businesses wanting to employ the best available monitoring and tracking spy software. It is more streamlined to better fit smaller needs while keeping all the important features available. You can efficiently track, monitor and control web filtering with ease. Further tools available for network administrators are Event Log and Server Management products. The Server Manager offers a strong list of security and management features that can streamline the work necessary to run the infrastructure otherwise. The Event Log Management offers to consolidate a long list of possible data sources and also offer separate disk monitoring software. Not available for iOS – iPhone or iPad devices. SpectorSoft products are mainly intended for computer users. The software is available across Windows and Mac OS while eBlaster is the only app available on mobile and for Android only at this time. This is one of the main reasons they rank lower on our list, as the site focuses on mobile apps. For those whom strictly use Android devices and want a solution for both computers and mobiles, than the choice could not be any clearer, as there is no better option out there combining the two while offering such high quality software. We searched high and low on SpectorSoft’s website for some mention of the recent US ruling requiring these types of apps to inform the user of monitoring. This is done via a Pop Up which must be shown on the target device at least once every 24 hours and is usually accompanied by a persistent notification in the notification bar. We’ve yet to see the pop up. eBlaster will eventually either be forced to add the notification or may even face a worse fate like the Stealth Genie which has been shut down by the FBI as well as seeing their CEO arrested. Either way, we’re recommending all users avoid American companies going forward as there is just too much risk involved. You can consider eBlaster and SpectorSoft a high-end service provider and the support team is second to none. You can quickly contact them through a toll free number, live chat or open a ticket. Their team of professionals will provide service that leaves nothing to desire. You have a problem, they find a solution. If you’re a business owner or network administrator, and still feel intimidated by the various plans, the sales team will quickly assess your needs and find the best tailored solution for you in no time, while helping you every step of the way until you are in full operation. Along with a great team, the website is rich in content with a great knowledge base and product information section for each service. Price versus value ratio is hard to beat with eBlaster and all Spector software, but you are limited to purchasing a yearly plan as opposed to having the option of purchasing 3 or 6 months. Although many options are available, ordering a package becomes simple, as you only need to select your device type and the yearly plan will be presented with all the included features and 1 year of full support. One thing to note, is that refunds must be claimed within 72 hours of purchase. If you happen to need more than one service, bundle offers appear at checkout. Various packages for server and log management available as well. I want to spy to my gf. If her phone does not belong to you and you put spyware on her device without her knowledge you are breaking the law in the US. If it is your children that is a different story.